Heavenly blog! : No. 1574: Open letter to Vebjørn Selbekk for lack of support regarding the question of freedom of belief and expression! No. 1574: Open letter to Vebjørn Selbekk for lack of support regarding the question of freedom of belief and expression! Open letter to Vebjørn Selbekk for lack of support regarding the question of freedom of belief and expression! Picture of Torodd Bird Stack that can be written absolutely. It's strange that the polite lets him hold on, which after all is Europe's biggest and worst online role to keep on without stopping ?! Even though he writes as satire, it's not allowed to write absolutely everything. The polite laughed at him in Oslo District Court, which only shows that they let me and my family be free! A police and judiciary without empathy is a bad "party"! Whilst they will take, which is probably Norway's most beautiful and honest man! What is this? An attack on all that we stand for in the western world from the police and the courts in Norway. It is not only Muslims and Arabs who behave badly in relation to freedom of belief and expression. It may as well be both the police, the courts and others if they are not looked after and allowed to hold on as they themselves want. 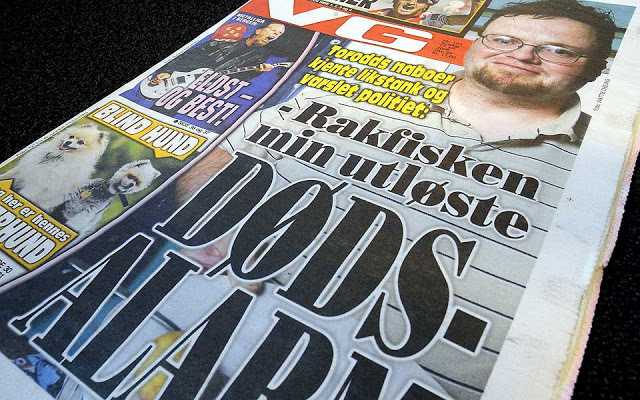 That's why we need the free press that you're part of, Vebjørn Selbekk, to reveal such relationships. In this case between me and Jan Aage Torp, do you have a great escape for uncertain reasons? Are you afraid of Torp, or are you now starting to climb and make sure that no one or anybody is preventing him from continuing to climb? I do not know, but it's a big escape to not let me write freely. Both in the newspaper Day and on the web, it's sad! Esther 4 14 For if you are quiet at this time, there will be deliverance and salvation for the Jews from another place, but you and your father's house will perish. And who knows you not just for a time like this has come to the queen's worth? Vebjørn Selbekk you fronts freedom of speech and expression, this is very, very good! But you are familiar with my case. That I mean you do this half-heartedly since you have not let my views come forward. Is this so important? Yes, not least in my case. You fought against extreme Muslim forces, and of course it was really bad. And very difficult for you, your family and supporters. My struggle is different and have in common that they will limit our ability to write, debate and feel free! I have a fight against the prosecution force and the polite as fully proven has gone in to get me and make me and the heavenly blog judged. As a result, I get a much smaller elbow room to write and speak. Just think about Vebjørn how bad this is. I was charged with one thing, it was debated in court. Was convicted of something completely different. Then it's a justice word and you're not writing this. Then you do not frustrate freedom of speech and expression. I get accusations against me that seem to be written in a "boy's room" when I am accused and appealed to opinions, attitudes and views that have not been addressed in court. In this judgment, they write to me that it seems to be a persecution against Jan Aage Torp. As the whole judgment is based on this and this question has not been the subject of discussion in court, it is of course a factory judgment! Is this so important? Life goes on and everything looks so good! I do not think that one can not hold on like this in a free and good democratic society. Doing it, we are at a level of security that is not a democratic society worthy of Norway! You want Muslims to change and become more democratic. I do that too. In your case, things went well, but unfortunately, Muslim countries have not changed as much as we would like. But you have been taken into the heat of the Norwegian society, which is good! But in my case, it will be the opposite, I will be persecuted by the community you have been taken into the heat of. Then my question is why you do not dare to let me come up with my views? Have eg Written reader posts to the newspaper the day about this and have not received anything. Do you really think your support for freedom of belief and expression is inadequate. I have proclaimed upbringed preachers, where Jan Aage Torp has been hit by it. He went with a "fictional" review to the Manglerud politician who blindly believed him. We have debated Torp's life after online review. Then 95% of what was written about Torp, after his review was written. In court, this was only mentioned by Torp, and it was not documented. We thought this had nothing from the matter, so it was not further debated. Just this, the amount became the "falling" proof. Those who did not participate in the trial, and which have not been dealt with in court, are decisive in this case. Then let's say it's a justice word! What Torp himself and his disciples have encountered both in abundance and verbal words and expressions are far stronger and more in quantity. In other words, the police and the prosecution force operate with two sets of laws. One for me and one for everyone else. This is also against all justice, democratic laws and common sense of justice! Me and my family have experienced the most possible, by lying, fabricated things and document falsification. Dozens of personal emails against me and my family and our employers. Our children are hanging out, even as gay. Be the desired death and much, much more! Do you understand Vebjørn Selbekk that you do not want to write about this or let some of your journalists write about this from my side. It will put you in a bad light now, after all, you have been respected here in Norwegian society. But what does my judgment show? It is not only in the Muslim world there is a narrow clue for freedom of belief and expression. But highest here in Norway, and certainly throughout the western world and the rest of the world. We must fight it for this day. One day there are Muslims and Arabs who attack it. Next time this is in the Western world and then both by Christian and secular heathens. The freedom of religion and freedom is absolute, so the sentence is against me both Christian persecution, attacks on freedom of belief and expression, and the justism of times! This is worth re-writing, but maybe the costs are too high? Taking one of what Torp has written about me, he surpasses me many, many times. He appears to be a classic netroll and full of hatred against me and the heavenly blog. This something I have not done since I've written that Torp is a psychopathic, nasty, spiritual speaking leper and a fool Apostle. Then the court behind my back and Brynjar Meling has given a judgment that has not been dealt with in court, which one should have written about. My lawyer Brynjar Meling has also to some extent been fooled. Under the court, all the judges have agreed with him, we thought we were on a right track. My lawyer has stated that wrong use of law has been used against me and the heavenly blog. Then with support including From Jon Wessel-Aas who has said that this case belongs to the Norwegian Supreme Court, but it was denied there without any justification. In other words, they have led us behind the light by debating this in court extensively. While what I have been convicted of has been completely overlooked. It tells me that the whole judgment against me - even if it is peanuts - then in relation to money. Then this is a form of acting and cheating that is a unjust state! Are we in Congo or Norway? I want to say Norway, but it feels like Kinshasa and Congo. Has one been charged there with the kind of trial that we saw on Tjostolv Moland and Joshua French which of course was nothing but a "Kangaroo trial" with a verdict that was as credible as an adventure. In other words, the whole process of the process against me and the heavenly blog is deepest seen an attack on all that we have built in the Western world over time! Vebjørn Selbekk, here you should come to the pitch and drop me to. And even take the magazine from your mouth and let one of your journalists interview me so that people have some kind of opportunity to understand the matter. Unfortunately, this case has been so sober and unreliable that most people obviously believe more in the lie than the truth! Hope for a posetive response and that you will understand that freedom of belief and expression is something we must fight for each day? Not just one day, then one day there are Muslims and Arabs who want it away. Here, as in my case, there are people in the Western world, with the police, a fool's Apostle and the courts. It's as dangerous and suspicious, no matter who it's trying to remove and limit freedom of belief and expression! Do not be so blue-eyed and believe that we in Norway and the western world are "finished" mature. While Muslims and Arabs are not. No matter what country, relationship and Governance we live under, everything will always be put under pressure! The freedom of religion and freedom is something we must fight for and stand up for everyday! It has been shown in my case that here a fool's Apostle may have both the police and the courts. Voluntarily or not, it has obviously happened here when the whole case against me and the heavenly blog is a fake room built on a police report which is false accusation as it is my view and preaching of the Christian marriage that has created this conflict, nothing else. The notification to Torp was a scary cry to make this happen, one does not see this so is a naive, faint-sighted, almost blind!